Everyone knows that Mason jar ideas are one of THE DIY crafts of this decade, but just because you are upcycling jars does not mean you have to skip having some class. Just a little bit of gold paint transforms these Mason jar crafts into something you might find at a millionaire’s picnic. Clean glass thoroughly and let dry. Apply a thin line of adhesive around the top of candlestick. Press jar into adhesive and let dry. Apply a thick coat of Scarlet Soft Fabric Paint over candlestick and halfway up the jar. Let dry. Apply two thick coats of Metallic Gold Soft Fabric Paint over Scarlet paint. Let dry completely. Did you know this is not the first time mason jars were the trendy purchase of the moment? Foodies and crafters alike are wild about Mason jar vases and other crafts, but this is not the first time these glass containers flew off the shelves. Mason jars experienced another 15 minutes of fame back in the 1950s and 1960s. Much like today, DIY ideas and DIY crafts were experiencing a popularity with people wanting to save money by preserving food and getting back to their roots through canning and jams. Still, mason jar crafts like mason jar vases are the it craft of the year and have been for several years now. From serving as rustic drink containers for sweet tea in southern homes to being transformed into DIY lighting ideas, mason jar crafts have made their way into every crafting world! In fact, in 2013 modern sales of mason jars surpassed every other year the trendy little jars were sitting on the shelves. Wow it amazes me how many different crafts you can do with mason jars and they keep getting better. 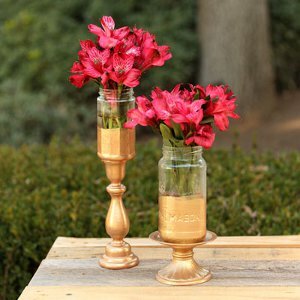 These gold tipped mason jar vases can go from a table for a barbaque on deck to a spring or summer outdoor wedding. Don't want gold than choose a color to match your decor. The best part about it is you can make it with real or fake flowers. This is so eye-catching. I know the perfect places to showcase this mason jar piece. Nobody Will guess that they're dollar store picks. Sometimes you don't need to break the bank to have a stylishly decorated home. These mason jars are exquisite. Perfect for intimate occasions. Weddings are perfect examples. The gold and scarlet pearl made these mason jars look very elegant. I am so glad I found this DIY craft, because my girlfriend is getting married in mid-July and her colors are gold and red. I have been bugging her and bugging her about what I can help her with- these would be dirt cheap and would create a great impact on the tables. Fun idea and article. I remember rows of Mason jars lined up on shelves under our basement stairs as a kid with the latest crop preserved. Later, I remember when drinks were first served in a jar! Now my son makes candles in them... They are so sturdy and versatile. I was thinking of these as tinted at the top, since gold tipped, but they are actually gold based, s and are lovely! I could see gluing on some shells or rhinestones for added bling! So pretty, and the glue used is the best too. 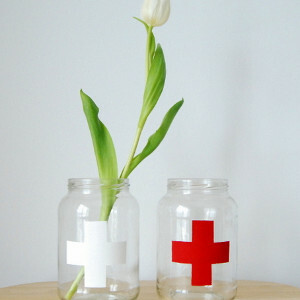 This is such a simple way to make a mason jar look classy. Love it! What a great idea. It's easy, quick and not that expensive. I read thru the instructions and I am going to try it. But instead of gold I want to do them In silver. I have much more things in the rooms I will use them in that will go better with silver including a silver chandelier over the table.thank you for sharing a great idea. These look so professional and chic. I think this would make a great gift for mother's day or something. I thinks this is so classy and chic! I like that you can pair any color of kind of flower with gold so it's perfect for no matter what kind of flowers you get! Plus, its super super simple which is always a bonus! Gold is one of my favorite colors for accent decor pieces. I think it looks so chic, and on mason jars has an elegant, rustic feel.